Dramatically eye-catching. Year in and year out, cherry blossoms rekindle awe and elation at the arrival of spring. And this Girl with Cherry Blossom has obviously taken all of her inspiration from nature’s beauty and bounty – each delicate pink blossom looking amazingly real. Combined with traditionally simple tableware and accompanied by other flower bearers, this Blossom Girl adds a charming lightheartedness to springtime gatherings of family and friends. Birthdays are such special days. Loved ones come to visit, wishes are shared, laughter and merriment fills the air. When you’re looking to make someone’s big day all that much brighter and create a lasting memory for them, our Well-Wishers are just the right envoys! Why not make it even more personal by having your loved one’s name inscribed on the base of the figurine? The famous Moon Family returned to our collection in May 2016 – looking just the same as when Olly Wendt designed them back in 1925. Now, more than 90 years on, Father Moon, Mother Sun and their four Star Children watch over young and old alike as they sleep. With their beaming faces they enchant all who see them, both by day and night, and make a heavenly gift to mark a birth, a christening or a birthday. 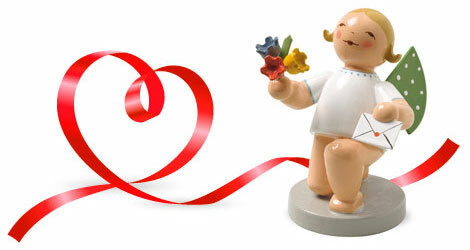 Did you know that Wendt & Kühn that you can add your own personal inscription to selected figurines? That`s what our “My Wendt & Kühn” offer is all about: High-quality unique pieces, never to be duplicated again in all the world. A distinctively personal way to say “thanks”, extend birthday wishes or commemorate a baptism. 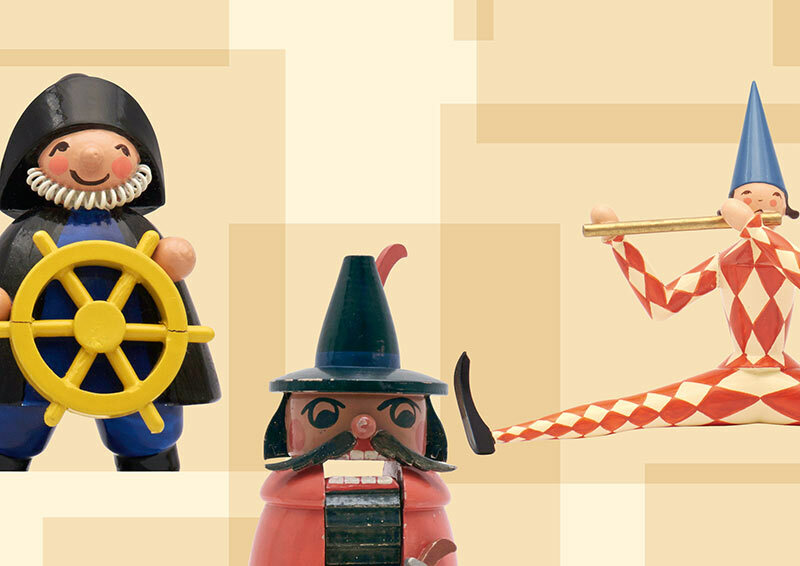 The Grünhainichen figurines are always delighted to take on the role of a personable well-wisher. Would you like to give greater prominence to individual figurines in your collection? Here your favorite figurines get a new stage on which to shine. You will be thrilled with the design possibilities offered by the wall-mounted display shelves with seven sliding plates. You can mix and match your figurines to suit the season, the special occasion or simply because you want to. It was often everyday things that gave Grete Wendt the inspiration to create new figurines. Native meadow flowers or school children in front of the half-timbered house on Chemnitzer Straße. But she was also approached with numerous requests from outside. Companies, institutions and the state approached Grete Wendt to have the designer realize their ideas. Since April 13, 2019 at Wendt & Kühn World in Grünhainichen, our new special exhibition “Commission accepted! 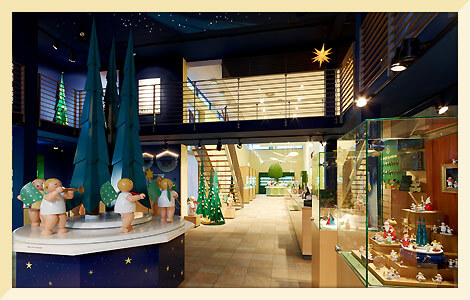 Special edition figurines for companies, institutions and specialist retailers” have on display selected commissions. Join us every day from 10am to 5pm to follow our fascinating research. Travel stands for a spirit of adventure and discovery, it opens our eyes and teaches us tolerance. Whether you are travelling near or far, to exotic lands or to find yourself. The new Gold Edition from Wendt & Kühn, the Globetrotter, aims to discover the world – accompanied by you! Simply photograph your Globetrotter in well-known locations or in front of tourist attractions around the globe and upload your picture directly to our website by 01 August 2019. As a thank-you we will enter all participants into a prize draw to win one of ten examples of the next Gold Edition. Want to know more? You will find all the details here. In May 2018 a masterly trio of owls joined our collection. They are a reissue of figurines that first appeared in the company catalog for 1930. No other group of figurines from Wendt & Kühn combines perfection of form and color as impressively as these owls. The way they are painted is quite unique and makes them true masterpieces of figurative craftsmanship. An exclusive video shows the painstaking work that goes into their production and how the unique paint effects are achieved. You will be amazed! Are you planning a day trip with friends, family or just for the two of you? How does a fun-filled day exploring a unique atmosphere and making lovely new discoveries sound to you? Then please come visit us at the Wendt & Kühn World of Figures. Wander through our magical world of Blossom Kinder and eleven dot angels and delight in the melodies ringing out from our many music boxes. We’re open daily from 10:00 a.m. to 5:00 p.m.